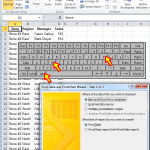 Introduced in Excel 2016 is the Multi-Select icon for pivot table slicers, a welcome convenience to the heretofore requirement of pressing the Ctrl key to select multiple labels. 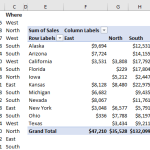 In the picture for example, I clicked the Multi-Select icon, then clicked to deselect the states of Arizona, Iowa, and Michigan from appearing in the pivot table’s Sum of Sales. 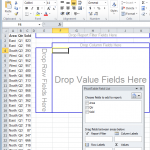 Here is how you can copy a specific pivot field and display its data on another worksheet. 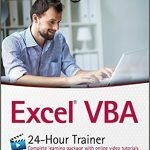 In the following pictures, only the columns of a pivot table’s Sales field are copied to Sheet2 so you can work with that Sales data independent of the original pivot table. 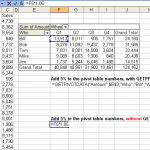 When you are doing calculations in cells outside of a pivot table that involve cells inside of (that is, belonging to) a pivot table, sometimes you want just the pivot table’s cell value, and other times you want the relative position and content of the cell with the GETPIVOTDATA function. 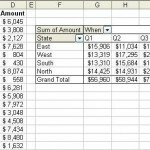 Here are two macros you can use for refreshing all the pivot tables on your active worksheet, or all the pivot tables in the entire worbook. 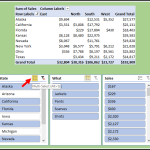 If you’d appreciate the convenience of having your pivot table automatically refresh whenever you change its source data, here’s how you can accomplish that. 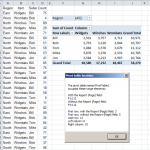 In the Before picture, the source data’s State field lists American states. 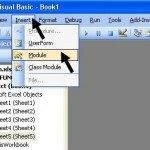 You may find the need to delete all pivot tables that are on a worksheet, or that are in the entire workbook.